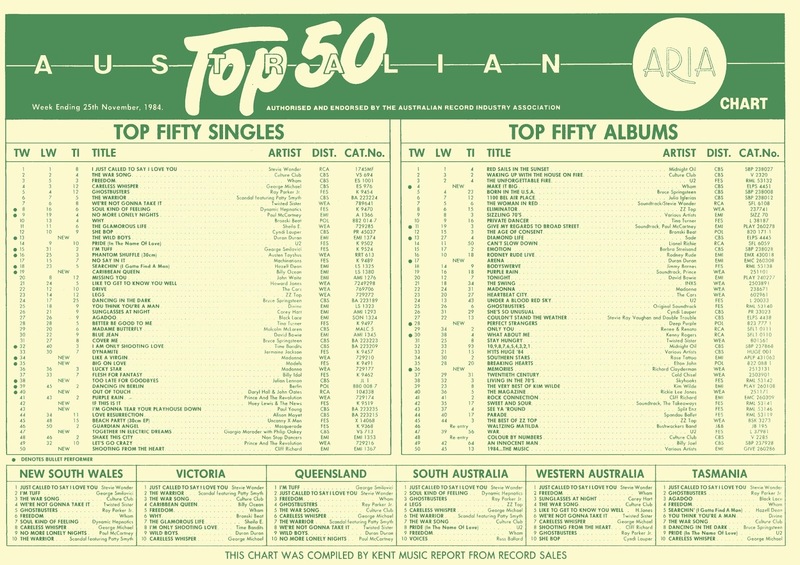 There are big chart weeks and then there was the ARIA singles top 50 from this week in 1984. Among the 10 new entries - the most for the year - were a chart-topper, a number 2, a number 3 and a number 5, plus a bunch of other songs that really should've been that big. She made it through the wilderness but could Madonna navigate Venice's maze-like canals? Easily the song that had the most impact was the lead single from a female artist's second album. As well as getting to number 1, the track would turn her from successful pop singer into a superstar. As a bonus, her future number 1 single would be the one to knock "I Just Called To Say I Love You" off the top spot. Although not for a few weeks, with Stevie Wonder spending his sixth (of eight) week atop the chart this week in 1984. One of two singles debuting on the top 100 this week from the sophisti-pop band named after singer Sade Adu. We'll see the other one do significantly better next week. 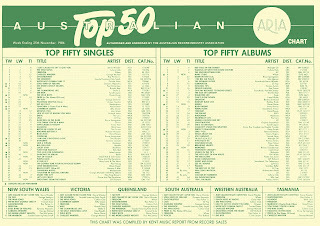 It'd take three years and a remake for John Justin to breach the top 50, something he couldn't do with this debut single, which featured the musical talents of Kate Ceberano (backing vocals), James Freud (bass) and Phil Calvert (drums). The only one of the 10 new entries not to make the top 30 was the latest from Cliff Richard. "Shooting From The Heart" was taken from The Rock Collection, an album cobbled together from previously released (but not widely available) material and some new tracks, including this tune written by prolific songwriter Roger Greenaway. The song maintained a string of under-achieving singles dating back two years for Cliff, who, if nothing else, still had enough of a fanbase to register minor hits in Australia. The Human League's singles had also been under-performing lately, with the second and third tracks lifted from Hysteria not making a showing in the ARIA top 100. While it would be a couple of years before the British synthpop band returned to the chart, frontman Philip Oakey enjoyed a top 5 hit with this soundtrack single. Taken from computer rom-com (so modern!) Electric Dreams, which I've still never seen all the way through, "Together In Electric Dreams" saw Phil team up with synth pioneer Giorgio Moroder, who was recruited to do for Electric Dreams what he'd done for Flashdance a year earlier by the film's director, Steve Barron. Since Steve had previously directed the music video for The Human League's "Don't You Want Me", he suggested Phil for the track. These days, the song (which was my number 1 for 1984) is included in The Human League's repertoire, being performed by the band live and appearing on their greatest hits albums. One thing you might not have known about Paul Young's three top 20 hits from debut album No Parlez - unless you've read my recaps about them - is that they were all cover versions of little known songs. Paul continued that practice by remaking this tune, originally recorded in 1972 by Ann Peebles, which would appear on his upcoming second album, The Secret Of Association. For me, it was an odd choice of single, which moved away from the smooth soul of tracks like "Love Of The Common People" and "Wherever I Lay My Hat (That's My Home)" into harsher, funkier territory - and perhaps that's why it didn't perform better. Up until a week earlier, Huey Lewis And The News's third album, Sports, had yet to show its face on the ARIA top 100 despite its first two singles, "Heart And Soul" and "I Want A New Drug", both making the top 30. Things hit a snag when third single "The Heart Of Rock & Roll" missed the singles top 100, but the band got things back on track with "If This Is It", which, quite frankly, should've been a single much sooner. The doo-wop-style tune not only became the most successful single from Sports in Australia, but finally prompted the album to start selling. Fun (demonic) fact: "If This Is It" became Huey Lewis And The News's third consecutive single to peak at number 6 in the US. You could count on the fingers of one hand the number of big hits Hall & Oates had registered in Australia (i.e. five) before this lead single from 12th album Big Bam Boom. And the fifth of those top 20 singles had been two years earlier when "Maneater" reached number 4 - their highest ever placing locally. It was quite a different story in the US, where Daryl and John had previously racked up the same number of chart-topping singles (i.e. five), not to mention another eight top 10 hits, making them the most successful musical duo of all time. That status was helped by "Out Of Touch" becoming yet another American number 1 hit. The song, which gave them their final ARIA top 50 appearance, had a more synth-based sound and a dancier feel than anything the pair had done before - and it's my favourite of theirs, although the version used in the music video isn't the proper single edit. For second generation hitmakers, being the child of a music star must be a blessing and a curse. On the one hand, people will automatically be interested in hearing what your songs sound like; on the other, they're always going to compare you to your parent. That would have been especially the case for Julian Lennon, the elder son of one of the most successful and influential musicians of all time, and one whose death just under four years earlier had shaken the world. Julian proved up to the challenge with his debut album, Valotte, which was kicked off (everywhere except America) by the awesomely poppy "Too Late For Goodbyes". Enough people were interested in hearing - and purchasing - the song, and any comparisons to his late father mostly revolved around how eerily similar his voice sounded. Models had been having difficulty following breakthrough single "I Hear Motion" with another hit as none of the other tracks lifted from The Pleasure Of Your Company did anywhere near as well. Things fell into place with "Big On Love", which would end up on Out Of Mind, Out Of Sight when it was released nine months later. Their most commercial offering to date, it was produced by Reggie Lucas, who'd been responsible for the initial stages of Madonna's debut album. Speaking of... Madonna was just about done with that debut album (although "Lucky Star" was still in the top 40 this week) and ready to unleash the follow-up on an unsuspecting public. I say "unsuspecting" because who could have predicted just how massive she'd become over the next year? Of course, as soon as the title track and lead single from Like A Virgin - together with its glamorous Venice-set music video - made its debut, it was instantly apparent this was a career-making moment. The song had actually had its premiere during the very first MTV Video Music Awards in mid-September - an iconic performance in which Madonna, dressed in a wedding gown, writhed around on the floor. By the time the single was released a month-and-a-half later, it sped up the chart, giving Madonna her first (of many) number 1 hits in both Australia and the US. Written by Tom Kelly and Billy Steinberg (see also: "True Colors", "Alone", "Eternal Flame"), a demo version of "Like A Virgin" found its way to Madonna, who recognised the potential of the song. Producer Nile Rodgers, who was hired for Like A Virgin, wasn't so sure, but eventually came around to the track. Side note: the songwriters didn't actually meet Madonna for many years, and when they did, they were snubbed by the Queen Of Pop. Thanks to its title alone, "Like A Virgin" was always going to get a lot of attention - positive and negative. But it was also a great pop song - and I say that as someone who actually doesn't like it very much. Not only was it well-produced, catchy and everything else a big hit should be, it established Madonna's stance as an artist who would push the boundaries, embrace her sexuality and be a strong female voice for the ever-growing legion of fans who aspired to be just like her. Billy Ocean's first number 1 single was 16 months away but he came close with this song, which brought him back to the top 50 for the first time since his 1976 breakthrough hit, "Love Really Hurts Without You", peaked one place lower at number 3. The lead single from the Suddenly album, "Caribbean Queen (No More Love On The Run)" kicked off a huge few years for Billy, who notched up six top 15 singles in the next three-and-a-half years. The Grammy-winning tune was even switched up for its release in different parts of the world, with alternate versions "European Queen..." and "African Queen..." issued in relevant territories. Nile Rodgers was as busy in the mid-'80s as he has been the last few years, responsible not only for producing "Like A Virgin" but also this brand new song by Duran Duran. The only studio track included on the band's concert album, Arena, "The Wild Boys" was inspired by the novel of the same name by William S Burroughs, which the music video's director, Russell Mulcahy, wanted to turn into a film. Russell got to spend a stack of cash on the Mad Max-looking, water-dunking windmill-featuring music video for the song in the hope that a film studio would green-light the project. They didn't. Still, "The Wild Boys" did give Duran Duran another massive hit. In fact, its number 3 peak makes it their highest-charting single in Australia. In the US, the single spent four weeks at number 2, stuck behind "Out Of Touch" and "Like A Virgin". Next week: Prince helps another female singer out with a hit single, plus Sade's other single does manage to break into the top 50. Australia gave Madonna her first #1 single anywhere in the world with "Like A Virgin". I suspect we also gave her her first Top 5 single (with "Holiday"), but I'd need to double check that before stating it as a fact. Well deserved on both counts!! Carta - You are correct. 'Holiday' entered the top 5 on 14 May 1984. Madonna would have to wait until 13 October to reach the US top 5 ('Lucky Star'), and 15 December to reach the UK top 5 ('Like A Virgin'). This week is a contender for, if not the outright winner of, my favourite top 50 of all time. The new entries (give or take Cliff Richard which isn't bad) are magnificent. Brad - I'm not sure about Ireland. It peaked at #2 there, but I'm trying to find out whether that was upon its original release or in 1985 when it was reissued around the same time as "Into The Groove". I'd like to think that we did give Madonna her first Top 5 single anywhere in the world, though! Warners really should have brought her out her in 1984, but I guess she was already committed to filming "Desperately Seeking Susan" by the time she started having major hits here. 'Your Love Is King' was much bigger in New Zealand, peaking at #2. I was a bit shocked to see its low peak here when I looked it up, as it's a song I knew back then. It should have done better here; though, looking up its Australian release date (7 May 1984), it did somewhat 'well' to belatedly chart more than 6 months later. I like 'Together In Electric Dreams' but prefer the follow-up singles, as this one's a bit overplayed. 'Out of Touch' is the perfect early-mid 80s pop song. I hadn't realised before that they only had 6 hits here, and that this was the last one. It seemed like they were bigger. Julian does sound very similar to John, vocally, on 'Too Late...'. I think being John's son ultimately hindered his success. Surely the vocals were pitched upwards on 'Like a Virgin'; it sounds so helium-voiced. Wow, that was really rude of Madonna, if Billy Steinberg's account of meeting her is correct. I think 'European Queen' was the first 'Queen' released, as, from memory, it entered the UK chart earlier than 'Caribbean...'. Also, there's a boo-boo in the video, where a poster for 'European Queen' can been seen when Billy comes down the stairs in the first line of the chorus at 1:00.